This is the second of a two-part story about Chemours. Read an earlier piece, posted this morning, about a 2013 accident that injured 11 workers. Chemours had nearly three weeks to answer to demands from state environmental officials. But not until April 27, mere minutes from the deadline, did the company send its 30-page response and more than 950 pages of attachments, thwarting significant sanctions that could have hampered the Fayetteville plant’s operations. Chemours’s response and supporting doucments were made public this week by state environmental regulators who cautioned that the company’s filing is still under review. However, $100 million is a comparatively small amount for a company that reported $1.7 billion in net sales in just the first quarter of this year. Its fluoroproducts unit alone — which includes GenX-containing materials — is responsible for more than $725 million of those sales. The subtext of this statement is that Chemours could withdraw from North Carolina if it feels regulations become too onerous. If Chemours left the state, it would cost Bladen County about a million dollars in tax revenue, plus jobs: 400 to 450 people from there and surrounding counties work at the Fayetteville Works plant. There is a contingent of economic development leaders and employees who want to keep Chemours in Bladen County. However, a growing number of people in the company’s pollutant path are exasperated with both the company’s actions and state environmental regulators’ lack of meaningful action. DAQ issued a 60-day notice of intent to modify the Chemours air quality permit, one of many citations it has sent to the company. (The department has yet to levy a fine.) In the notice, DAQ required Chemours to show it was complying with all lawful requirements of the current terms of its permit. The notice also required that Chemours respond in writing by April 27 and demonstrate to the “division’s satisfaction: that emissions of GenX compounds from the Fayetteville Works plant do not and will not cause or contribute to violations of the groundwater rules — under any circumstances. Had the company failed to meet the deadline, DAQ could have revised its permit to prohibit the release of any fluorinated compounds. Since Chemours relies on these chemicals in its manufacturing, the permit would have forced the company to shut down most of its operations, at least temporarily. The company countered that it believes DAQ does not have the power to modify the permit; to try to do so, Chemours said, it “improper and arbitrary.” For one, there is no “public health emergency,” Chemours wrote. Nor did the permit in 2016 limit or mention GenX. Moreover, Chemours claimed that a “zero-emission standard” tied to a groundwater standard of 10 parts per trillion is impossible to achieve. DAQ has not required such a rigorous standard for any other company or chemical, Chemours said. However, no other company in North Carolina is known to emit GenX. At this point, though, resolving community concerns will be nearly impossible. As documented in a notice of intent sue filed by the Southern Environmental Law Center this week, the scope of the pollution is vast. 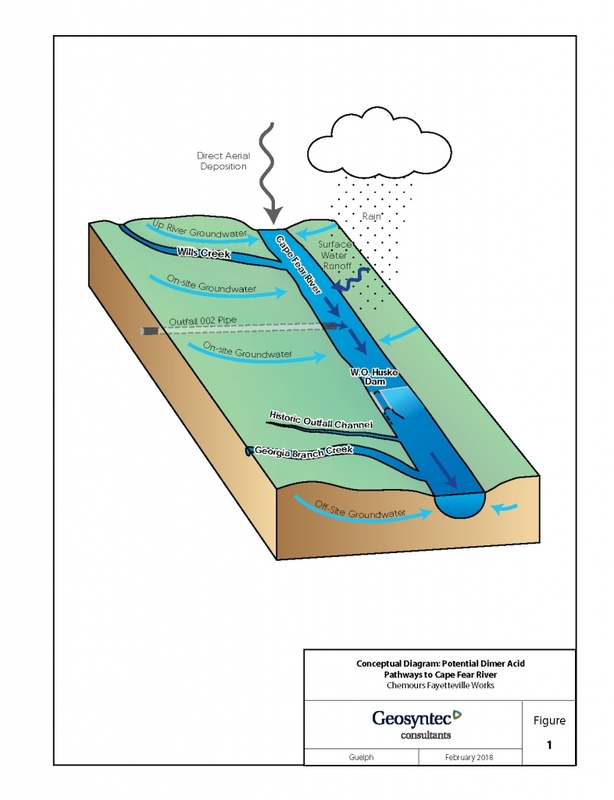 All three layers of groundwater are contaminated with GenX, and are connected hydrologically to the Cape Fear River. In addition, the “Nafion Ditch,” an unlined channel collects as much as 8 million gallons a day of contaminated wastewater, which then infiltrates groundwater beneath the plant and flows into the river. Two large unlined sedimentation basins that are pumped with contaminated fluid that also infiltrates the groundwater and in turn, the river. An an old unlined discharge point, “Old Outfall 002,” has eroded and now reaches deep groundwater aquifers. The Fayetteville Works plant reported yet another spike in GenX wastewater in early to mid-April. From April 5–7, the facility received about 1.5 inches of rain. Water leaving the facility and its grounds from Outfall No. 2 (it no longer goes into the Cape Fear but is contained onsite) on April 5, 9 and 12 contained concentrations of GenX of 91 parts per trillion, 1,300 ppt and 120 ppt, respectively. A sample taken onsite April 15 detected GenX at 1,981 ppt. Chemours Program Manager Christel Compton told DEQ in an email that the spike could be attributed to some clean-up work that stirred up contaminated sediment in a cooling channel.